Liberty! The country colossus puts those label woes to bed with his Big Machine debut, heavy on lush tear-jerkers of the romantic ("Friend of a Friend") and recently paroled ("Number 37405") variety. 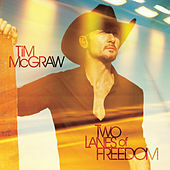 Tim ain't exactly reinventing the wheel here -- he's not even the first to call a song "Mexicoma" -- but his huge emotional range and megawatt affability are evident throughout, especially on ribald party-starter "Truck Yeah": You best believe he is the first guy to kick off a hit country song with the line "Got Lil Wayne pumpin' on my iPod." Taylor Swift and Keith Urban help close it out.